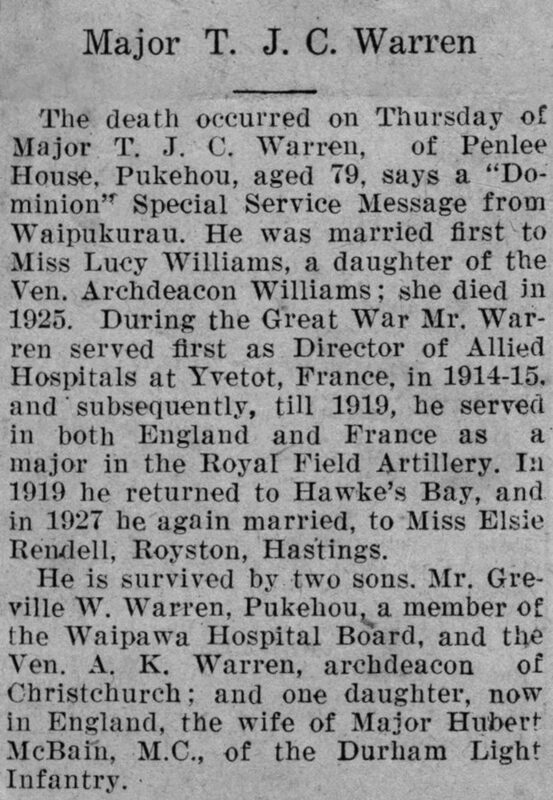 The death occurred on Thursday of Major T. J. C. Warren, of Penlee House, Pukehou, aged 79, says a “Dominion” Special Service Message from ‘Waipukurau. He was married ﬁrst to Miss Lucy Williams, a daughter of the Ven. Archdeacon Williams; she died in 1925. During the Great War Mr Warren served ﬁrst as Director of Allied Hospitals at Yvetot, France, in 1914-15 and subsequently, till 1919, he served in both England and France as a major in the Royal Field Artillery. In 1919 he returned to Hawke’s Bay, and in 1927 he again married, to Miss Elsie Rendell, Royston, Hastings. He is survived by two sons, Mr. Greville W. Warren, Pukehou, member of the Waipawa Hospital Board and the Ven. A. K. Warren, archdeacon of Christchurch; and one daughter, now in England, the wife of Major Hubert McBain, M.C., of the Durham Light Infantry.